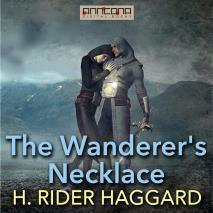 The Wanderer's Necklace is an adventure novel by H Rider Haggard first published in 1914. Olaf, a Norseman in the eighth century A.D., flees his homeland after challenging the Norse god Odin's right to a human sacrifice, travels to Constantinople (Istanbul, Turkey) to protect the Empress Irene Augusta from her son Constantine the Fifth and other enemies of the Eastern Roman Empire. From Byzantinum, to the pyramid tombs of Upper Egypt, Olaf becomes a traveling Christian who must reject the adulterous advances of Irene. Blinded as punishment for rejecting the Empress, Olaf's adventures are woven within the intrigues of the Eastern Roman Empire. Olaf begins his recollections with a polar bear hunt, leading to his fame as a great hunter, to excavating his previous life's gravesite to recover the Necklace. The other half of the Necklace lies on a mummy reposing within a pharaoh's tomb in ancient Egypt. The adventure novel shows how these two separate events tie together past and present lives. Total Running Time (TRT): 10 hours, 31 min. Reading by Annylee Hill.